The Save Our Spit Alliance took part in four events during the second week of September. One of the highlights of the week was our hosting of Professor Ross Klein, international authority on the cruise industry. Ross was the focus of a media conference and the keynote at a Public Information Night and a business seminar, 'Wake up to Wavebreak Breakfast'. Ross is an endearing person and a charming speaker who quickly dispels any idea of a person with a vendetta against the Cruise Industry. Ross freely admits, 'I do not accept payment for these speaking engagements, so I do not have a vested interest one way or the other, it is academic research for me, just presenting the facts from my research...and I like people listening to me'. Wouldn't we have all been better off if the GCCC had simply invited the softly spoken Canadian Sociologist come cruise-ship expert to address Councillors back in 2012 regarding the viability of a cruise ship terminal on the Gold Coast? How much income a port generates from cruise visits depends largely on where the port falls within the itinerary e.g Newcastle, Australia receives little/no income if it is the first port of call on the itinerary after the ship leaves Sydney because passengers are reluctant to spend onshore early in their trip. Hence negotiation for a CST requires deep knowledge of the industry and verifiable research into costs, income, risks and benefits and operational matters e.g Home (base) Port versus Visiting (port of call) Port. All of the main Cruise Companies use foreign flagged vessels with laws pertaining to those regions only i.e. they do not pay taxes in the countries they visit nor do they adhere to any local labour protection laws. 'Light skinned employees generally earn more than darker-skinned employees'. Greywater can legally be dumped in any port around the world - each passenger creates 300 litres of greywater per day and this discharge can be as harmful as raw sewage to fish species and reefs. The amount of money spent in a port is a totally distorted by cruise companies e.g. claims of '$1m walking off a cruise ship' every time it pulls into port is totally unsubstantiated by any factual evidence. Cruise companies collect 50-70% commission from land-based tours/excursions and activities and financially penalise land-based tour companies heavily if they a customer complains and/or requests a refund. Hence a passenger paying $100 for a tour – only $40 may go to the tour operator and the rest is paid as a 'commission' to the Cruise Company. Due diligence requires a '360 degree view' of the issues related to hosting cruise ships not just the PR-friendly arguments of a cruise company or the spin of a development consortium using a cruise ship terminal (cst) as their means to acquire public parks and waterways for private/commercial casino, hotel, apartment, marina, highrise constructions. The above issues and questions are just the 'tip of the iceberg' regarding the proposed Gold Coast cst. as outlined by Professor Klein. 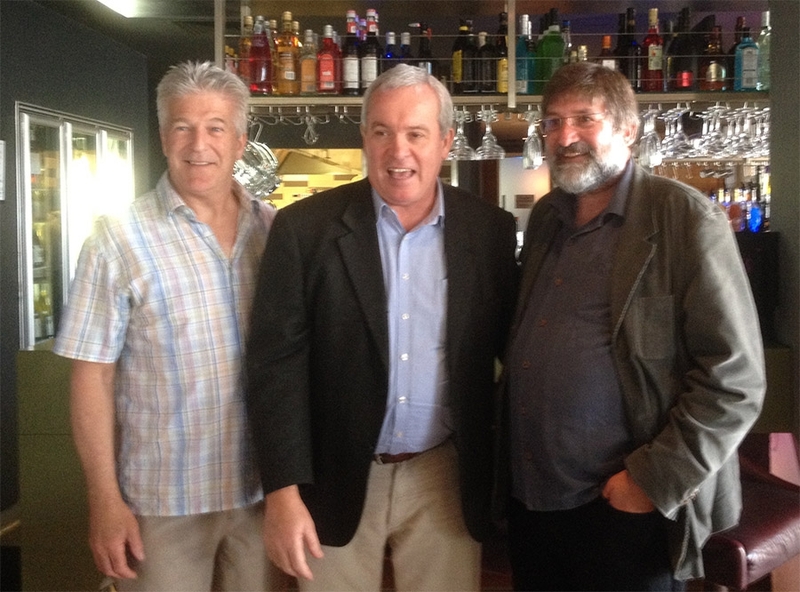 Only one Gold Coast City Councillor saw fit to have a representative attend Professor Ross Klein's key-note speeches. The remaining Councillors 'declined' SOS's invitation to attend either the Public Information Night or the 'Wake Up to Wavebreak Breakfast'. Apparently listening to Ross Klein, a world authority on the cruise industry (four times invited to give expert testimony to USA Congress and Senate inquiries) is not considered part of local Councillors due diligence to inform themselves as fully as possible in relation to the viability of cruise visits to the Gold Coast. BRISBANE is a better option as a future cruise ship terminal with the Gold Coast taking a gamble in developing Wavebreak Island, warns an international shipping researcher. Professor Ross Klein, a Canadian sociologist and author from the University of Newfoundland in St Johns, after visiting and checking both locations favours the River City. The Coast's terminal being moved from the Seaway to Wavebreak will not reduce dredging or environmental challenges and is of no value "if passengers never leave the ship or the island". Carnival Australia last month outlined an ambitious campaign to position Brisbane as the Florida of the market with a new port developed at the mouth of the river leading to talks with the local council and the State Government. Meanwhile, the ASF consortium is finalising more details on its proposed $7.5 billion international resort and terminal in the Broadwater. Professor Klein, who has been invited by community groups to speak at the Wake Up to Wavebreak breakfast at the Labrador's Grand Hotel on Friday, said it was important to understand that the Coast would only be a "port of call". Newfoundland had a similar narrow entrance to its harbour like the Coast and only one third to a half of the larger cruise ships could gain access during a "typical" year. "Brisbane is without a doubt a superior option, if for no other reason than that there is an international airport there with sufficient seats for inbound cruise passengers, assuming it is a homeport," Professor Klein said. "A key issue here is whether a port is a homeport, which Coast will not be, or simply a port of call. Brisbane can play either role and this versatility is a positive to cruise lines. "The Coast can only serve as a port of call, which limits income and makes the port vulnerable to weather conditions, economic conditions, and much more if cruise tourism is to be successful." Asked if both terminals could operate successfully, Professor Klein said ships stopping in Brisbane would not drop by at the Coast. "The Coast may be able to steal some of the business away from Newcastle on itineraries from Sydney to the South Pacific, but that is doubtful given Newcastle is a well-established deep water port that is accessible in most weather conditions. It is also known by the industry and has proven to be reliable," he said. 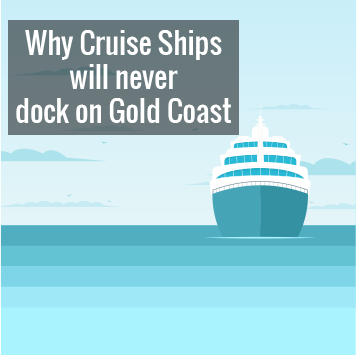 The biggest risks for the Coast was whether it was put on cruise itineraries, what the size of those ships were and whether they would dock or choose in weather conditions, like on the Sunshine Coast recently, to pass by. "The simple answer to the question– I think Brisbane has a reasonable chance of having a profitable cruise terminal," Professor Klein said. "I think it is a crap shoot for Gold Coast – as they say, "pay your money and take your chances". But let's keep in mind that the reason behind the development on Wavebreak Island really has little to do with the cruise terminal. "The cruise terminal is the incentive for getting permission for huge development that otherwise would not be permitted."